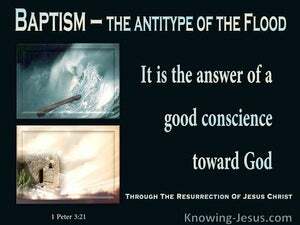 Baptism, the counterpart of that, now saves you (not the washing off of the filth of the flesh, but the prayer for a good conscience toward God), through the resurrection of Jesus Christ. 20 who once were disobedient, when the patience of God kept waiting in the days of Noah, during the construction of the ark, in which a few, that is, eight persons, were brought safely through the water. 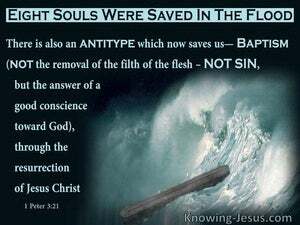 21 Corresponding to that, baptism now saves you--not the removal of dirt from the flesh, but an appeal to God for a good conscience--through the resurrection of Jesus Christ, 22 who is at the right hand of God, having gone into heaven, after angels and authorities and powers had been subjected to Him.